A woman has been shot dead and several people injured in clashes between garment workers and riot police in the Cambodian capital Phnom Penh, rights groups and family members say. The clashes began when hundreds of workers marched towards PM Hun Sen's home in the heart of the city. They were demanding better pay and working conditions. 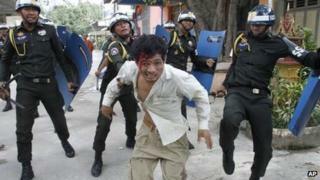 Strikes and violent demonstrations at garment factories in Cambodia have quadrupled over the past year. The sector, which accounts for 80% of Cambodia's total exports, is the lifeline of the country's economy. However, the majority of factory owners in Cambodia are foreign. They have seen their businesses grow, thanks to a combination of low wages and a government keen on encouraging private enterprise. Many among the industry's 500,000 workers say that strong growth in the economy means they should see more benefits trickle down to them. The protesting workers on Tuesday were from a factory which made clothes for Gap, H&M and other international brands. They have been staging similar protests for months. Correspondents say that it is unclear which side started the violence. Rights groups told the AP news agency that it began after protesters threatened to beat up five police officers who were sent to negotiate with them. Police responded by firing live bullets and tear gas to rescue their colleagues, while protesters threw rocks and wielded iron bars and wooden sticks to fend them off. The woman killed was selling rice near the protest and was hit by a police bullet in the chest, her family said. Rights groups say that six protesters were injured in addition to five Buddhist monks who were hurt when police fired tear gas into a pagoda where demonstrators had sought refuge. Nine other people were also reported to have been hurt. "The crackdown conducted by police this morning against workers was very cruel and unacceptable," said Kong Athith, spokesman for the Coalition of Cambodian Apparel Workers' Democratic Union. Police officials have so far not commented on the disturbances. Prime Minister Hun Sen said earlier this year that continuing protests may imperil Cambodia's garment industry and lead to firms relocating to countries like Burma, Laos or India where labour is cheaper.